Stepping on the gas a little too early for the exit of Ascari’s ‘Petit Eau Rouge’ corner, the back end of this Audi R8 ‘Performance’ breaks out. A quick application of opposite lock later, I’m pondering whether or not I’m actually going to be able to hold this slide. But no matter: the ESP kicks in, and smoothly nudges the car back into a straight line. It’s a reminder of why we like the R8 so much. It’s such an accessible supercar to jump straight into and drive quickly. But that’s not to say it isn’t exciting, as a full throttle run out of Laguna proves. The noise of that 5.2-litre V10 exploding away mere inches behind my head is one of the greatest of any car on sale right now, and I’ll miss it when it’s gone. Then there’s the way the car handles the tight ‘Piff-Paff’ chicane. It suddenly appears as you’re heavily loaded up on the exit of Sebring, and on this lap, I feel like I’ve come in way too hot. But with two quick flicks of the wheel, this refreshed R8 dances its way through, confidently shrugging off the dramatic changes in direction. As before, it’s, for the most part, a very neutral feeling car, with masses of grip and traction and a suitably sharp front end that’s a joy to tuck into the tighter corners here. 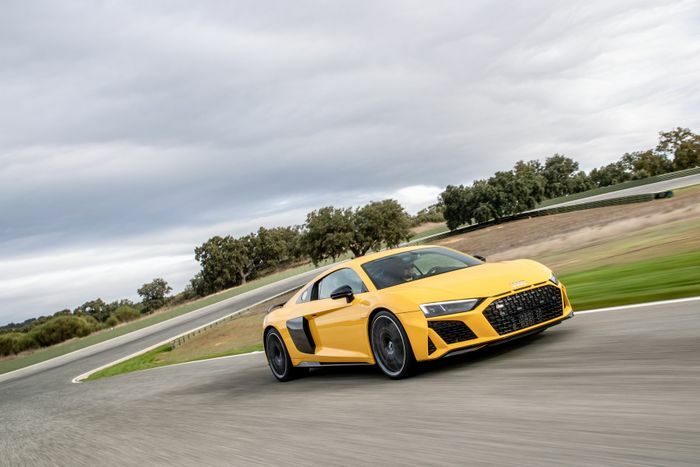 For the facelift, Audi has tweaked the suspension and recalibrated both the ‘Dynamic’ and standard electro-mechanical steering setups, so is it an improvement? It’s rather hard to tell. 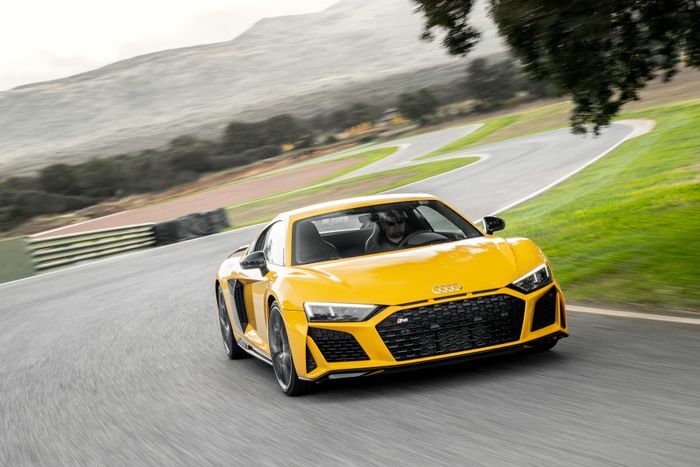 Our test of the rejuvenated R8 today is limited to this circuit. We won’t be driving it on the road, and what’s more, instead of the standard-fit Michelin PS4 S boots - which replace the Continental Sport Contact 6s used previously - these cars all have Pilot Sport Cup 2s. Yes, the standard steering does seem to have a little more life to it than before - steering having always been a gen-two R8 weak point - but fitting semi-slicks is going to do that. While also making the car considerably more capable than it would be on the less focused rubber. So, what we can’t give you today is a definitive verdict on the changes. I certainly can’t feel the extra 9bhp the Performance - formerly known as the ‘Plus’ - develops, and anyone who claims they can is lying. The one difference is the Dynamic steering - which constantly varies the steering ratio - does feel slightly less unpredictable, but it’s still best avoided for the standard, more natural-feeling setup. Also, after spending a lot of time gawping at this thing in the pits, I can report that the styling changes do look a lot more successful IRL than they did in the initial press images. I love the newfound aggression of the vent-festooned front end, with the Quattro-style slats being a nice finishing touch. 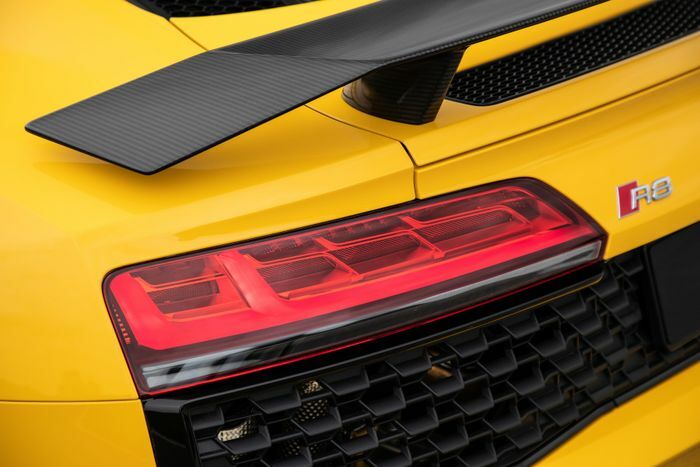 I’m less enamoured with the single, giant vent at the rear, but I’m definitely digging the return to oval exhaust pipes - a classic feature of the first-gen R8. Today doesn’t serve as a learning experience. That’ll come when we’re first able to get the car on the road. 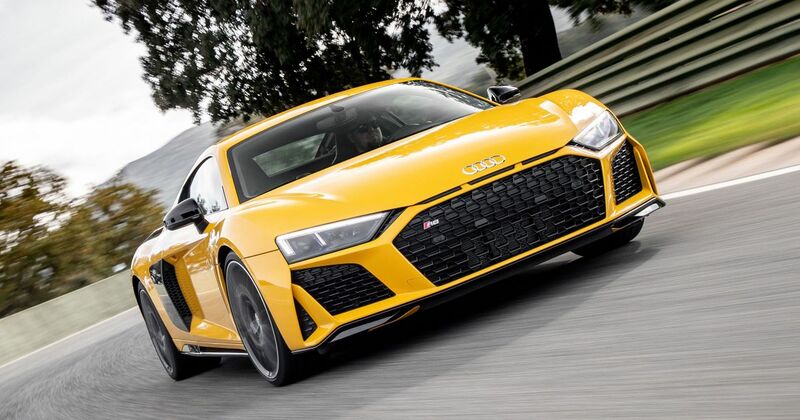 No, this is more of a refresher of everything that makes us love the R8. And as the sun sets on Ascari, I’m given another few laps in the supercar to soak up everything it has to offer with the added challenge of a darkened circuit. Eek. The full-throttle, uphill run out of the pits to the blind crest before The Screw causes an argument in my brain, with one part screaming to lift, and the other determined to keep my right foot buried for as long as possible. Illuminated by my headlights, the barrier close to my right appears to flash past even faster than it did earlier today. Breathe. In the end, I lift a little too early, but there’s no time to dwell, as we’re already around turn one and smashing through gears on the run to Copse. For the first time today, I take it flat, without a single screeching protest from the tyres making itself known and the R8’s lightly redesigned body exhibiting barely the faintest bit of roll. As ever, the engine dominates the experience, pinning me back in my seat and demanding shift right up by that near-9000rpm redline to make sure I feel the full 611bhp on offer. A turbocharged engine like the one in the Mercedes-AMG GTR might feel quicker thanks to its gutsy midrange, but I wouldn’t trade the high-revving theatrics of this V10 for anything. For the next few corners, though, I’m a little sidetracked. Because I’m lost. Driving with only headlights (the very good Laser headlights are thankfully optioned on this particular car) and the odd flood light to guide the way as a whole different ballgame, but a few messy corners and missed apices aren’t enough to fluster me. Nope, I’m in an R8, and it’s all in hand. Pulling into the pits two and a half laps later, I relax. I’ve brought the car home safely, ready for someone else to get behind the wheel and blast their way onto the circuit in another nerve-wracking game of play-the-endurance-racer. 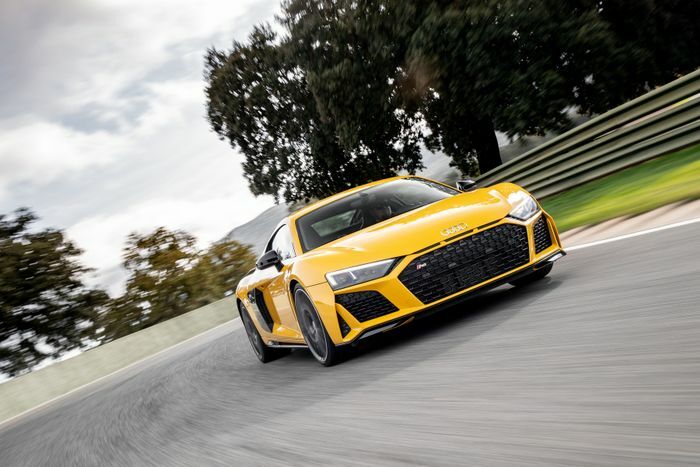 Plenty of other supercars might have been more engaging and demanding out on this tricky, undulating track, but I can’t think of a single other vehicle that manages to blend accessibility and capability while remaining thoroughly thrilling quite as the R8 can. 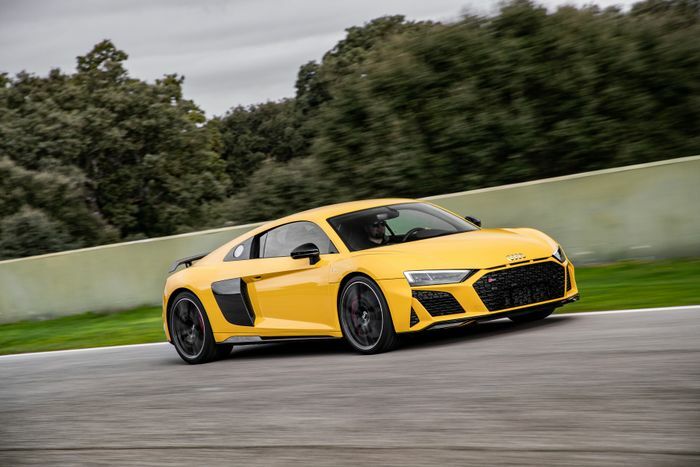 Audi claims it doesn’t have a direct successor planned for the R8, so this might be the last one to be powered by an internal combustion engine. 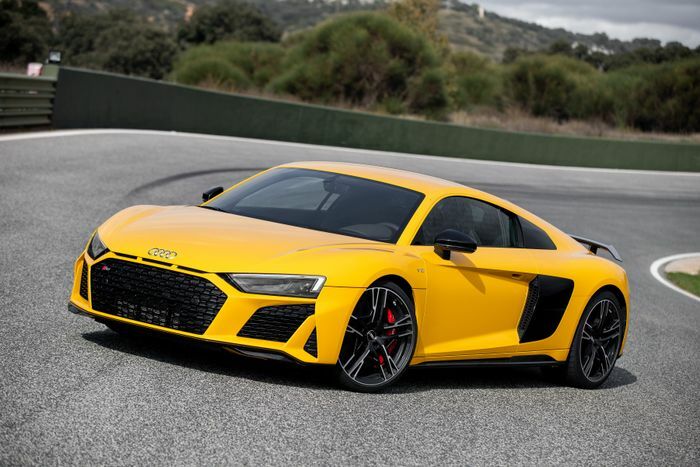 And we can say with near-certainty that there won’t be another with a V10. What a way to bow out. Recommended car throttle shop Worldwide Shipping In The CT Shop Car Throttle Submit Your Videos To Get Featured On Our Social Channels Features The MkI VW Golf GTI Is A Legend, But The MkII Is The One I Want Features BMW M850i Review: Do We Even Need An M8? Features 6 Fascinating Rotary Cars - That Aren't Mazda RXs Features Lamborghini Aventador S Review: The Last True Supercar? Features 2020 A90 Toyota Supra By Numbers: How Does It Compare To Rivals? Features Lotus Carlton: Meeting The Car That Made The Government Angry Features Jaguar XE 300 Sport Review: No V6, But Now The Handling Is Worth It Features Alfa Giulia Veloce Review: More Appealing Than The Quadrifoglio?